The presidents of Venezuela and Iran have called for a cut in oil production by the members of the Opec oil cartel. Speaking in Caracas, Hugo Chavez and Mahmoud Ahmadinejad said they wanted to co-ordinate the group to reduce the amount of crude oil on the market. Mr Ahmadinejad is visiting Venezuela at the start of a tour aimed at boosting ties with Latin America. 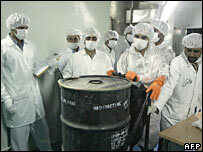 Venezuela has been a strong ally of Iran in its controversial pursuit of a nuclear power programme. 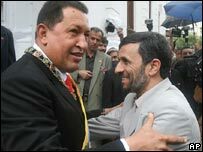 Mr Chavez welcomed Mr Ahmadinejad to Caracas, calling him a "fighter for just causes, to a revolutionary and a brother". He said the world oil market was oversupplied with crude, and said Opec should act to stop falling prices. Both countries are major oil producers and members of Opec. Venezuela and Iran have also agreed to establish a $2 billion fund for projects across the developing world, he added. While in Latin America, the Iranian president will also meet the leftist leaders of Bolivia, Ecuador and Nicaragua. Mr Ahmadinejad's talks with some of the US's most vocal critics is likely to alarm Washington, says one of the BBC's Latin America correspondents, Duncan Kennedy. With his eyes fixed firmly on the Middle East, the last thing President Bush wants is another hostile diplomatic front opening up in his own backyard. But with the arrival of the Iranian president in the region, that is exactly what some commentators are predicting. The most worrying alliance for Washington is that being forged between Iran and Venezuela, our correspondent says. Mr Chavez and Mr Ahmadinejad are expected to sign a series of new trade and economic co-operation agreements. "Iran and Venezuela are two important allies on a global level, the two countries have important industrial and oil projects, which we will follow up in this trip," Mr Ahmadinejad said ahead of his trip, according to the state-run Irna agency. Washington will be watching closely for any concrete measures or policies that develop - chief among them, any sign of Venezuela pursuing its own nuclear programme in conjunction with Iran. That would be unacceptable to Washington and would turn what are now uneasy relations between the two states into something much more serious, our correspondent says. Mr Ahmadinejad will also visit Nicaragua, where Daniel Ortega, the former Sandinista revolutionary, took office this week following his election victory. The Iranian president will also attend the swearing-in ceremony of President-elect Rafael Correa in Ecuador on Monday. Ecuador's new president opposes a free-trade agreement with Washington, arguing it is damaging to Ecuadorean industry. Mr Ahmadinejad is also expected to meet other South American leaders, including Bolivia's Evo Morales, on the sidelines of the ceremony.